Hellbound 9×4: I just know I need to solve this. Can you imagine how uncomfortable this must have been? 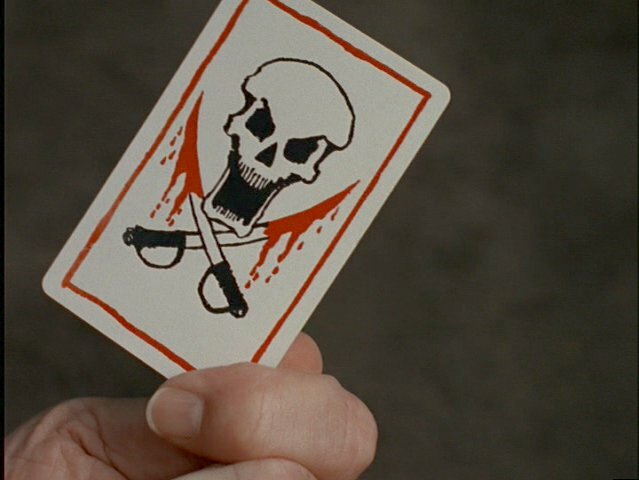 “Hellbound” is The X-Files’ third take on the subject of reincarnation after “Born Again” (1×21) and “The Field Where I Died” (4×5). Out of the three episodes, this is definitely the best. I still don’t think it’s great, however. It’s not that I don’t appreciate what’s here, it’s what’s not here that leaves me feeling mildly disappointed. I know nothing more about Agent Monica Reyes at the end of the episode than when I first started this little showcase piece for her character. I know nothing more about her personality or her personal motivations. All I know is that her reincarnated soul has been unsuccessfully chasing the same bad guy since the 1800s. Or rather, she chased the original bad guys and then the bad guy that they created through their evil actions. I don’t know what about these crimes in particular so compels her soul. Is it the unusual level of violence that troubles her? Does she have some kind of relationship with the perpetrators? Does she just have a strong, motivating sense of justice? If she does, I’d like to know. I know that she feels things, but I already knew that. Other than telling her that there’s something fishy going on, do these feelings of hers ever actually solve cases? Because right now these “feelings” she gets in the presence of evil don’t have a great track record when it comes to being useful. Nothing was resolved in either “Empedolces” (8×17) or “Daemonicus” (9×3) and she barely makes a dent in the evil here. What I don’t know is why she’s on the X-Files. I mean, yes, I know she’s there because Doggett needed an ally and he trusts her both personally and professionally. 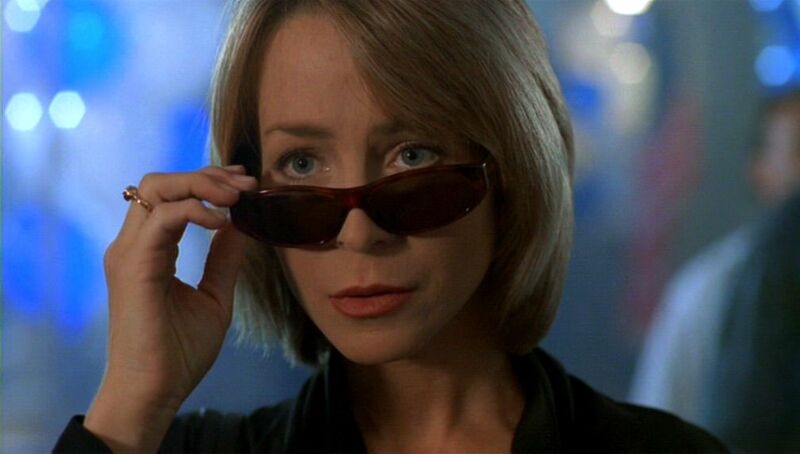 But her history with Doggett tells me a lot more about Doggett than it does about her. And I know that her expertise is Religious Studies and that she investigated crimes with a seeming Satanic bent. That sure sounds like it makes her a good fit for the basement office. But I also know that by her own admission, she’s never seen evidence of real Satanic activity. Then why is she so interested in the X-Files? Why is it her “dream job” according to her conversation with Follmer in “Nothing Important Happened Today” (9×1)? Is she here because she’s looking to find evidence of real activity? Is she here because she does or doesn’t believe in Satan? And further back, what brought Reyes to Religious Studies in the first place? 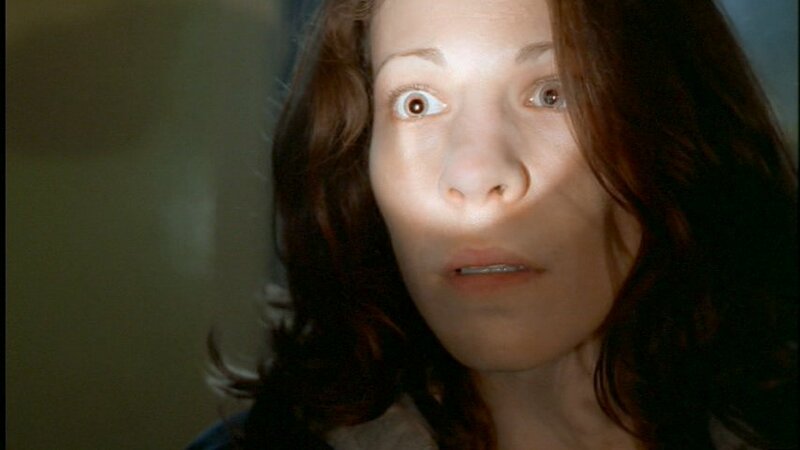 Ironically, thanks to the Doggett-centric “John Doe” (9×7), I know she was raised in Mexico, a predominately catholic country. Did she study religion because she was a good catholic girl? Because she wasn’t a good catholic girl? How did she end up so new agey? I’d like to know Monica Reyes, please. Her character started off with real potential and I still like her well enough. But she’s quickly turning into a stock believer. 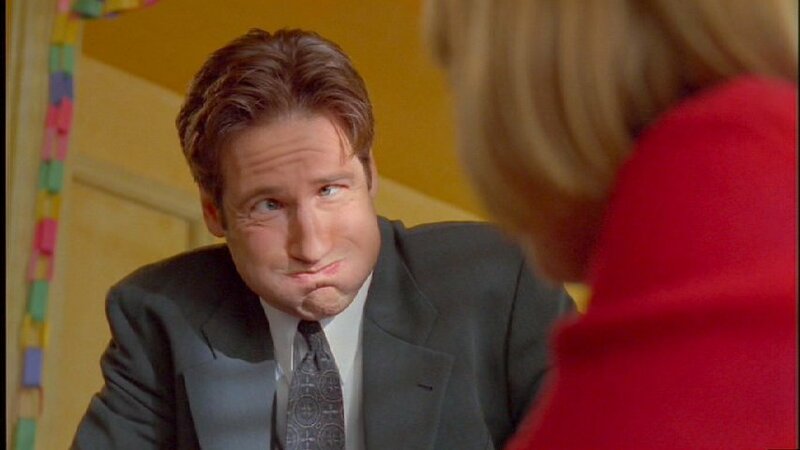 Mulder believed because of certain experiences, certain information, and certain hypnosis sessions. He believed because he needed to. Am I to take it that Reyes believes solely because she feels things??? That’s a character cop out, 1013. There was a lot of room for exploration in this episode for themes of sin and redemption, destiny and freewill… in other words, plenty of chances to get inside Reyes’ head and figure out what makes her tick, what motivates her, and what she thinks her purpose in life is or if she’s still trying to find one. Maybe she’s unsure of the state of her own soul and that’s why this case is so important to her.. Heck, maybe she’s on the X-Files because she wants to understand the nature of evil. How about that? In an odd twist, I personally enjoy this episode more than Doggett’s “John Doe”, but coming straight off of that episode into this one highlights its weaknesses in the character development department. In both episodes, our two new leads set out to discover their individual identities. Doggett has his memories taken from him and, by sheer force of will, takes back what belongs to him, pain and all. His display of character and integrity even when he’s been stripped to nothing tells us a lot about who he is as a person. Reyes, on the other hand, finds out she had an identity she didn’t know existed. That knowledge doesn’t shock her, scare her, inspire her, drive her… she comes to a conclusion about the events of the case and then the end. The events have no bearing on the rest of her life and reveal no new side of her. I can only guess that at some point she wonders if she committed a great sin in a past life, but if she does, we don’t see any signs of an internal conflict. All right. I know I’ve belabored the point. It’s just that in retrospect, I know this is Reyes’ one chance to distinguish herself as a character and I’m disappointed on her behalf. Reyes: Whoever I was, I failed. In 1868, in 1909, in 1960… I failed. I was always there, but I couldn’t stop the killings. And he knew that. And somehow he knows my deepest fear: that I’ll fail. I guess this is the closest I’ll come to the answers I’m looking for. Perhaps Reyes is sensitive to evil in all its forms because she’s spiritually connected to a particular evil. Perhaps her regret and fear of failure drive her forward in the pursuit of defeating evil. Perhaps? The X-File itself is okay. Actually, I think the premise had real promise. A group of men bound together in hell, which is spiritual and physical death on repeat, want to be redeemed but aren’t allowed to be. As mentioned earlier, the themes are ripe for the plucking. Everything you ever wanted to know about skinning people but were afraid to ask. But while it’s a unique form of death even for The X-Files and I can tell the crew worked hard, it must be said that the makeup is less gross than shocking in its completeness. And it looks like a special effects job the whole time. I like the short scene between Scully and Dr. Mueller. It reminds me of other times Mulder and Scully consulted a retired detective about an old case. “Squeeze” (1×2), “Tooms” (1×20), “Travelers” (5×15)… There are more, I’m just too sleepy to remember them. Reyes was able to save one soul, but the killer continues into the next life with the other victims. Is that enough to break the cycle? Reyes doesn’t need to follow him in death? I guess one of our leads killing themselves would put a damper on the show, huh? Scully: My name is Dana Scully. I’m with the FBI. I want to ask you some questions about a John Doe you did an autopsy on in 1960. Dr. Mueller: You honestly expect me to recall some case from way back when? I’m 84 years old. Scully: Sir, this particular victim was skinned alive. Dr. Mueller: The victim was a John Doe, a nobody. Carl Hobart, the county sheriff, figured he was a drifter. Hobart said he didn’t want to stir up the community. Scully: And no one called him on that? Dr. Mueller: I tried. The sheriff had other things on his mind, I suppose. Scully: Why do you say that? Dr. Mueller: Well, it wasn’t long after that he put a bullet through his head.